This is a take on a fish cake from an Indian cookbook I have. While the nori flakes do give some sea-like flavour, the end result is nothing like a fish cake, of course, but still tasty. I actually liked these better the next day after being fried up in a pan. I think it's because the potatoes firm up a bit and are less gooey. Still, either version is pretty good and the kids loved them. 1. While potatoes are cooking and cooling, crumble tofu into a bowl. Add green onions, chile, ginger, cilantro, nori flakes, flax seed, cornstarch, and salt and pepper. When potatoes are cool enough to handle, mix into the tofu. Knead a bit with your hands to being it all together. 2. Whisk cider vinegar into soymilk. 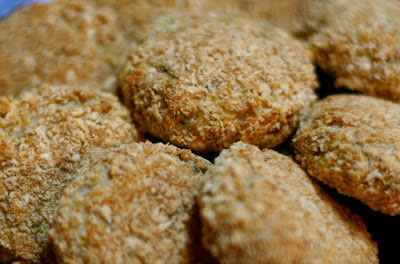 Shape potato mixture into patties, dip in soy milk, then roll in bread crumbs, pressing the patty into the crumbs to get a good coating. Place on prepared baking sheet. 3. Bake for 30 mins, turning patties after 20 mins. Serve with chili sauce.